Craving some adrenaline or adventure on your trip to the Red Centre? Fear not, our helpful guide Tom has compiled a list of our top Red Centre Adventures. Scenic flights offer a unique perspective and way to see the landscape of Outback Australian. A few companies operate scenic flights above the National Parks of the Red Centre, with helicopters or light aircraft. These flights offer unique views of some of Australia’s most spectacular landmarks, including Uluru, Kata Tjuta, Mt Conner, Lake Amadeus, and Kings Canyon. If getting up in a helicopter isn’t enough adventure, get on board with the team at Skydive Uluru! These guys are offer the only Sky diving experience in the Red Centre. This is by far the most thrilling activity you can do in the outback. Not only do you have various options for different heights, but before the jump you’re taken on a bonus scenic flight of Uluru. Just remember not to have a big breakfast before you go. We may be a little biased, but joining a Segway Tour around the base of the rock is one of the best ways to experience Uluru. Jump on, and let this Uluru tour take you around the entire base. Whilst cruising the rock on Segway, learn history, culture, and geology from our friendly guides. It’s a fun, entertaining combination of ancient Australia and modern technology. If you enjoy combining the great outdoors with hard work, then you’ll definitely want to fit in some hiking while you’re in the outback. Kata Tjuta offers two tracks with the Valley of the Winds being the more difficult of the two, but all the sweat is worth it when you see first-hand the views it has to offer. Another hike out this way is the Rim Walk at Kings Canyon in the Watarrka National Park. The first 15-30 minutes is the hardest part of the track. After the challenging start the remainder can quite leisurely. Don’t worry, you’re heart will still be pumping though, because as the name suggests the walk takes you around the rim of the canyon with nothing but your steady footsteps to keep you from going over the sheer vertical cliffs. The Rim Walk is the perfect combination of spectacular scenery with a hint of danger. 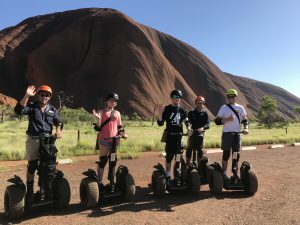 If you want more information about how you can join one of our Segway tours around Uluru, click here or alternatively contact us.